Uses:- Fulvestrant Medicine is used to treat breast cancer that has spread to other areas of the body in women who have gone through "the change of life" (menopause). It is used in patients who have not responded well to other medications (e.g., tamoxifen). Breast cancer cells need the hormone estrogen in order to grow. 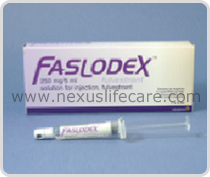 Fulvestrant Medicine works by blocking the effect of estrogen, slowing tumor cell growth. Side Effects:- Pain/swelling/redness at the injection site, nausea, vomiting, loss of appetite, constipation, diarrhoea, upset stomach, dizziness, tiredness, weakness, headache, body aches/pains, flushing and sweating (hot flushes/hot flashes).